Achieve design consistency that meets industry best practices regardless of vendor. Select upstate NY clients that have used our Technology Systems Design Standards services. Ensure that all technology projects and systems meet industry standards. Typically the designs of an organization’s technology infrastructure and interconnected building-based systems are in the hands of numerous vendors and contractors. However, organizations typically lack documented enterprise-wide design guidelines to ensure a consistent baseline of industry best practices is applied to all technology projects regardless of vendor. As an independent technology consulting firm with more than 20 years experience in the design of technology infrastructure, Archi-Technology is well suited to develop systems Design Guides that are comprehensive, accurate and up-to-date. NYS school districts: This service qualifies for BOCES aid. Contact us for details. A set of reference documents that ensure technology infrastructure and systems designs meet best practices. Select the image to see select pages from a sample Division 27 (Telecomm Infrastructure) Design Standards guide (PDF). Schedule a free, no-obligation call with one of our independent advisors to see how your organization could benefit from our Electronic Facility Records (EFR) services. Our T-Series drawings use symbology that conveys unique properties of technology systems, components and connections. T-Series drawings document unique aspects of data systems. Archi-Technology has been in the forefront of facilities documentation for more than 20 years with our proprietary T-Series technology drawings. Organized by building, floor, serving zone and systems, a unique comprehensive set of symbols document the complexities of data-based systems. 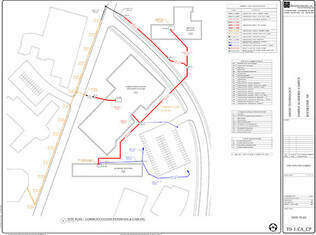 ​​Plan to manage wisely with Archi-Technology.